The first time I visited Wizard’s room, I immediately fell head over heels in love with it. 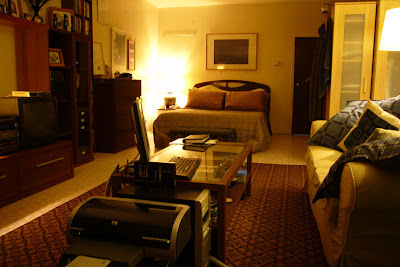 I was 18 and still sharing a room with my younger sister so the spaciousness of his room was very much envied. Although minimal, his decorations exuded warmth; adding to its already welcoming ambience and putting you at ease almost at once. Anyway, recently Wizard decided to give his room a makeover and I heard he’s been quite busy, shopping and putting the finishing touches. 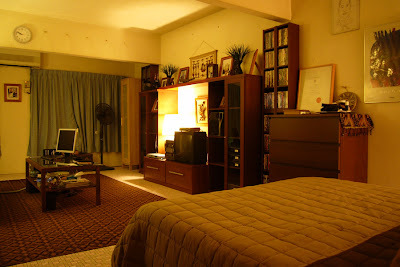 When he finally revealed his "new" room to me last week, I was almost speechless; he did such a fabulous job! Let's take a peek inside Wizard's "Living Room". Extremely inviting isn't it? 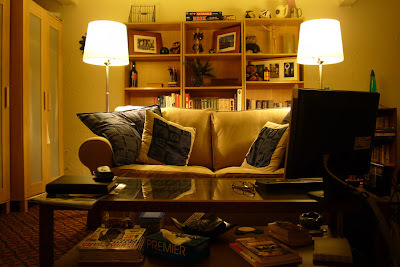 He ensures comfort in this corner, complete with a PC, high-speed Internet connection, and a PSP to keep him entertained. 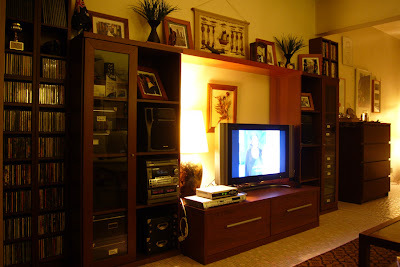 If you're in need of more entertainment, this corner will do the trick - fully equipped with a DVD Player, Hi-Fi system and a 32-inch LCD TV. This whole wall is fantastic, I love it! Now who wouldn't want to nod off in this comfy bedroom? Everything looks so crisp and fresh I feel like snuggling underneath the covers to take a catnap! Last but not least, is my absolute favourite spot. Would love to dive into the love seat and mess up his neatly arranged fluffy pillows! I also like the bookcase and warm lights effect. This entire setting gives me the impression of a lovely corner featured in a fancy Home magazine. So if you're reading this Wizard, I am even more in love with your room now. It's truly fit for a King. The only thing that's missing is a mini-bar! And oh yeah, you've also inspired us to pay another visit to IKEA soon, Happy Birthday Wizard, have a blast! Marzie! What a fantastic room! So the wizard, is it your dad? Hi Mariuca! Just added both your sites! Try the ViraLink and Viral-Icons too! They both work wonderfully! Looks like a plush room from "Lifestyles of the Rich and Famous". Hi, you have a very nice site. Can't get over the room! so cozy! OMG!! This is his room as in bedroom?? wow.. no need to leave the room lah like that except for mealtime..I love it!!! Yelah.. OMG yet AGAIN!! Awesome lah this room.. surely inspired to do lots of stuff kan? siapalah wizard ni...mesti orangnya sekemas biliknya. The lighting pun cantik kan, LJ? Cosy and warm, romantic jugak! I love those huge cushions! Sneaking up on Emila.. Boo!!! Best nya kalau dapat guling2 atas katil itu skrg! Hehe..tu la C pun dah tido ni, berdengkur. I salu kejutkan sbb snoring is bad for health! wahahahaaa! i know i know! la la la la i know who's the wizard! lalalala debbie pun tak tahu! Ya!!! Wizard itu telah membuka rahsianya! hahahaha! but i'll keep the secret between the three of us: me, marzie and wizard! eh maybe 4...er 5 kot!